Once again, I'm continuing on my mission to revisit some restaurants in hopes of accomplishing a few things. First, I want to see if they are as good or bad as the first time I tried them a few years ago. Second, I would like to try more items to give them a fair shake. Third and most importantly, I want to retake my photos. You see, I started off with my Blackberry, then upgraded to my Canon point and shoot; ultimately graduating to a DSLR. I'm quite OCD about my pictures and if I didn't do something about the crappy ones from the early beginnings of this blog, I would go nuts. So here I am back at Minori, which is often herald ed as the best Japanese restaurant in North Delta. Of course that is not really of an accomplishment since there are only 6 other Japanese restaurants within a 2km radius. However, it is what it is and finally I have returned. Joining me for lunch was Pops, who is usually a willing participant in my lunch adventures. 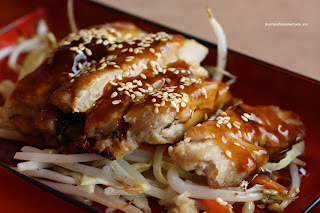 Now, the first time I ever ate at Minori, I was thoroughly impressed at the quality of the food, especially since I was not expecting much in North Delta. Su re, it's not Japanese-run; but I rather let the food do the talking. Interestingly, the lunch combo has shrunk in size. There seems to be less food in the bento box and in fact, there are only 4 pieces of California Roll to the 6 I had 2 years ago. At least the quality didn't suffer. The rice is still of a pleasing texture being chewy with a touch of sweetness and vinegar. 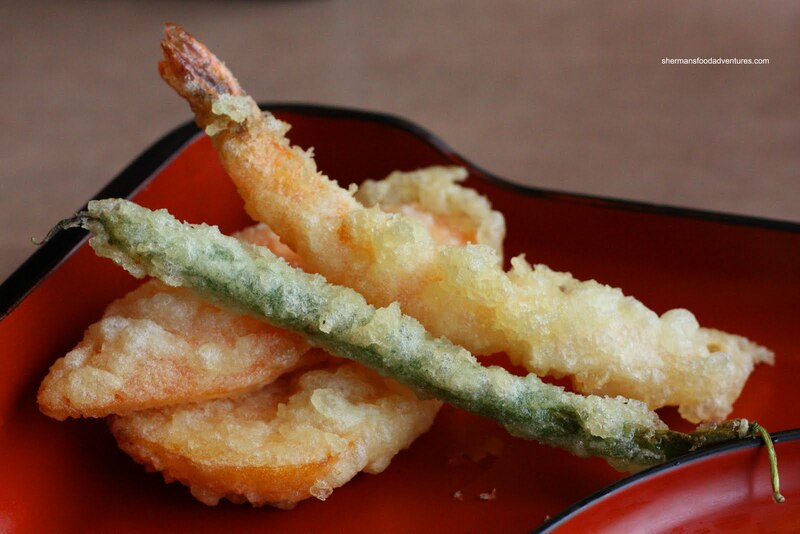 The Tempura is still very good with a very light batter. It's crisp and none-too-oily. Once again, it is only modest in size. The last item in my lunch combo was the Chicken Teriyaki. By looking at the picture, it is not very apparent how much chicken there is in relation to the size of the box. I was able to finish this in a few bites. With that being said, it was once again decent. The chicken was moist and there was just enough sauce. Too bad I didn't take a picture of the box as a whole because you could see much more box than food! Now Pops had a different combo that included nigiri. I was going to post that picture here; but we ended up ordering a Party Tray C for a meeting we had a few weeks later. 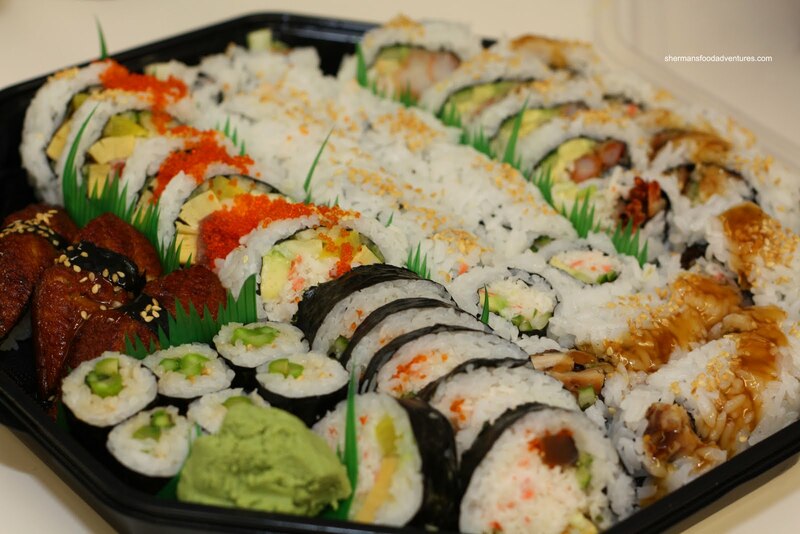 Hence, the picture of the Nigiri is that from the tray. 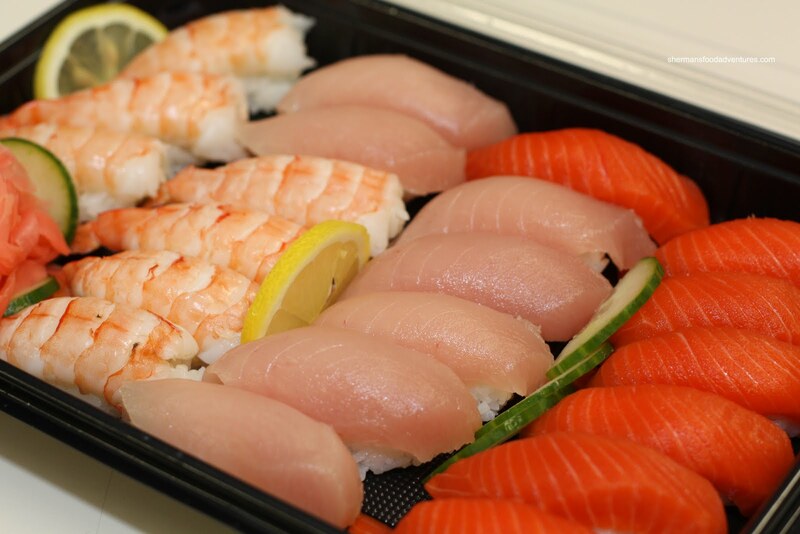 You'll noticed that the salmon is of the wild sockeye variety (in addition to the tuna and ebi) and that is the same for their combo as well. We found the fish to be of good quality and texture. However, the slices were quite thin. The other part of the tray consisted of a House Roll, Futomaki, Chicken Teriyaki Roll, Dynamite Roll, California Roll, BC Roll, Chopped Scallop Roll, Asparagus Roll and Unagi Nigiri. The size of the rolls were not too bad and not over-ladened with rice. Pretty good stuff, although I found the chicken teriyaki to be overcooked and hard. 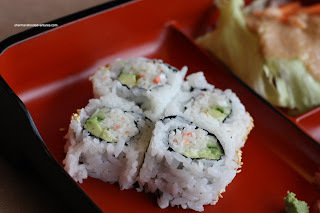 Surprisingly, I really liked the asparagus roll despite my aversion to anything veggie in maki sushi. As with most things at Minori, the rolls were solid. Now solid food is one thing; but with this current experience at Minori, I have noticed a trend. The portion size seems to be shrinking. Not a big deal if you don't have a big appetite; yet it could matter to some when you can get more food for the same price at other places. We ended up actually ordering the other half of our takeout meal from Nordel Sushi (I know, not my favourite...) since their combos have more food. Of course the quality lags behind Minori... 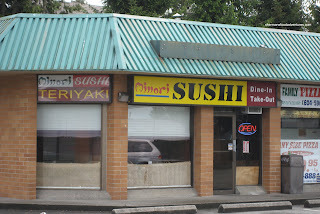 So my point is - if you don't care about quantity and want mainly decent food, then Minori is probably still the best in North Delta. you were in my "hood" and didn't tell me! .. I like sushi too..